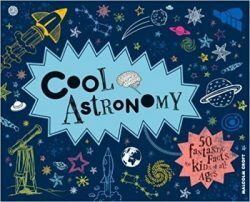 DESCRIPTION FROM THE PUBLISHER: 50 fun, simple and entertaining ways to improve your understanding of astronomy for kids of all ages! Discover how telescopes are made, learn about invisible light and study the scale of the universe in a way you’ll never forget! The follow-up to the popular Cool Science and Cool Maths, also by Portico. Inside this mega-jam-packed book are fifty fact-tastic ways to advance and improve your astronomy skills so you’ll never feel alone in the universe again! Learn amazing space-related tricks such as how to watch a solar eclipse safely and mapping stars from your own back garden, right down to expertly simplifying the supermassive numbers and distances involved in the space between space so you’ll never forget them! With Cool Astronomy, you’ll discover everything you need to know about the universe, from Asteroids to Zubenelgenubi… and almost everything in between!